Congrats! You’ve Been Accepted to CLACS- Now What? Congratulations on your acceptance to CLACS at NYU! You’ve been accepted to a challenging and enriching interdisciplinary program with amazing professors and students in one of the most extraordinary cities in the world. You’re probably beyond excited for this opportunity and eager to get started, but you may not be sure just yet if this program is the best fit for you. We are here to answer any questions you may have and give you any advice that we can offer. Please share your thoughts and questions in the comments section below, and we’ll quickly respond. Be sure to take your time when making this decision; it’s a big one! 1. What kinds of issues and research are students interested in? Students are interested in a very wide range of topics, which is what makes CLACS what it is! These range from heritage tourism in indigenous communities, Brazilian immigration to the US, and Jesuit history in Cusco, to US and Latin American relations during the Cold War and women’s reproductive rights in Latin America. Check out our current student profiles to learn more. 2. What countries do students go to? Students go all over the region! During Summer 2012, students conducted their research in countries such as Perú, Colombia, Argentina, Guatemala, Puerto Rico, Ecuador, Cuba, Mexico, Brazil, and even Spain. A few students also elected to do their summer field work here in the States as well. 3. Is there a wide scope of themes that the classes cover? Have you been able to take classes that fit your interests? While the core CLACS faculty definitely have their specialties, CLACS students often take courses in other departments in order to gear their coursework towards their specific interests. This is actually probably one of biggest advantages of being in CLACS- the versatility and flexibility of this interdisciplinary program allows you to mold your coursework so that you get the most out of the degree. We also have a consortium with Columbia University that makes some Columbia courses available to CLACS-NYU students. 4. What kinds of opportunities are there to improve my Spanish or Portuguese? There are classes available within the Department of Spanish & Portuguese in the Graduate School of Arts and Sciences (GSAS). 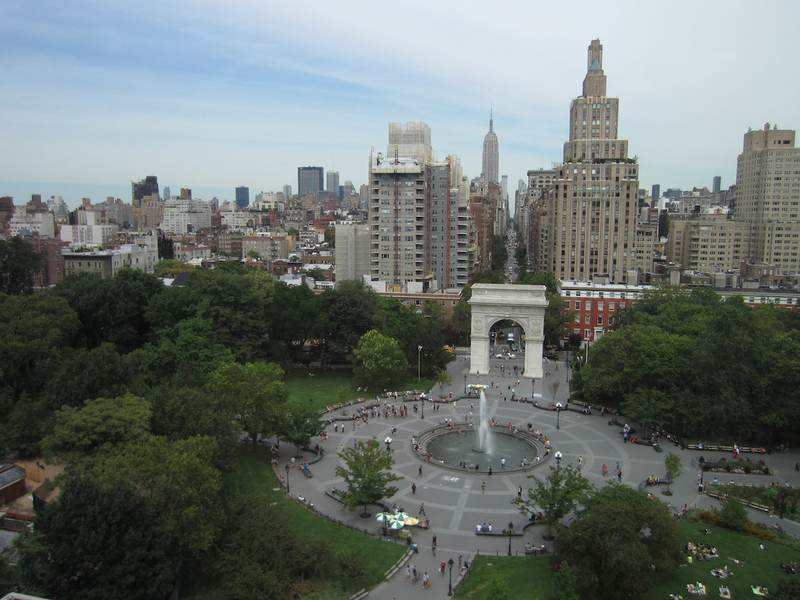 You can take language courses at the School of Continuing and Professional Studies at NYU. Conversation classes are also available through Speaking Freely. 5. Is it possible to have an internship and/or work while going to school? Many students do have part-time jobs while attending CLACS. Internships are popular and encouraged, and they can be completed for two or four credit classes, depending on how many hours per week you work. Please visit the CLACS website to see a list of organizations where our students completed internships, or consult the NYU Wasserman Center for Career Development for assistance finding the right internship program for you. Additionally, CLACS also offers Graduate Assistant positions for selected students each year. 6. Are a lot of the students coming straight from undergrad? Every cohort is different, but there is generally a good mix of students coming directly from undergraduate programs and those with a few years of work experience. Everyone brings their own unique experiences and contributes to the diversity at CLACS. 7. How available and helpful have professors been? The professors and advisors are supportive and dedicated. Even if your interests are outside their realm of expertise, our core faculty (who will also be your advisors) all offer helpful insights. Also, CLACS affiliated faculty and other professors are really open and willing to help. 8. Where do most students live? How should I go about finding housing? You can apply for NYU graduate housing, but finding your own apartment is also an option. It is relatively easy to find sublets or apartments online or through friends and other students. Don’t be afraid to look into Brooklyn or Queens, which can be a lot more affordable than living in Manhattan. The NYC Subway system is very reliable and can be accessed in so many places. When searching for an apartment, keep in mind affordability, proximity to the train, commute time to NYU, proximity to things like grocery stores, laundromats, etc., and whether or not you would like to be close to restaurants, bars, bookstores, etc. 9. What kinds of study abroad options are there? If you want to work on your Quechua or Portuguese over the summer, there are FLAS fellowships available. In the first year, students are also encouraged to apply for CLACS grants to do field work for their thesis projects over the summer. This is one of the most unique and beneficial aspects of CLACS, and there is a lot of support from staff and faculty throughout the process. 10. Have you been able to meet students from other programs, or do CLACS students mainly spend time with people in their cohort? What kinds of opportunities are there to get involved in student life? CLACS intimate size results in a strong sense of community with both your cohort and with the second year students that is felt as soon as you arrive in New York. As for student life, there are many events held through GSAS and GALAS – the Graduate Association of Latin American and Caribbean Studies. While the coursework of this program is demanding and could feel overwhelming at first, it’s important to remember make time for relaxation and recreation outside of school. Remember that you would be living in New York- one of the greatest cities in the world- be sure to enjoy your time here! It will be an unforgettable experience. We hope to welcome you in the Fall! This entry was posted in CLACS News and tagged CLACS, CLACS NYU MA Program, CLACS-NYU. Bookmark the permalink.